Slovenia boasts some of Europe’s best hiking trails and alpine landscapes. Luckily, the country’s most beautiful trails see relatively few visitors, as most travelers flock to Lake Bled. If you’ve visited the Dolomites, you’ll notice that Slovenia’s mountainous landscape is strikingly similar to that of north-eastern Italy. The Slovenian Alps make up the south-easternmost part of the Alp chain and the southernmost part of the Limestone Alps. There are three mountain ranges in Slovenia: the Kamnik-Savinja Alps, the Julian Alps, and the Karavanke Alps. 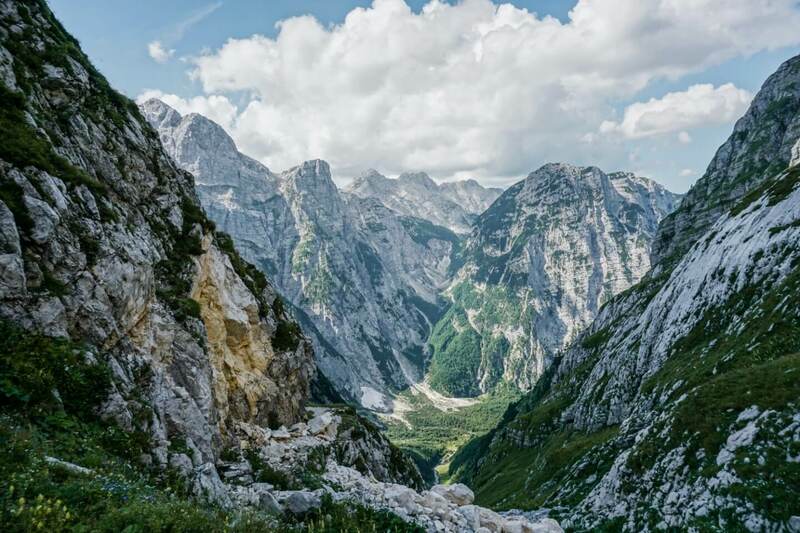 We concentrated our time in the former two and will be sharing the absolute best day hikes and hut to hut hiking trails in the Kamnik-Savinja and the Julian Alps. 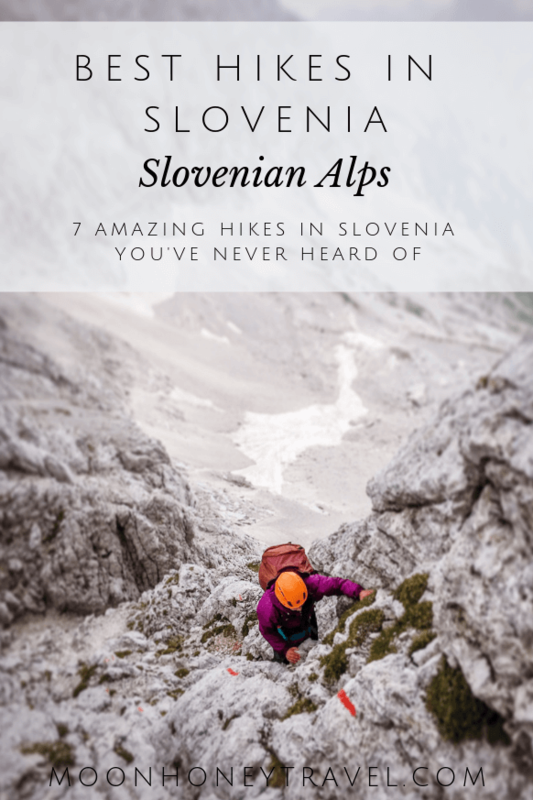 Before we dive into the best hikes in Slovenia, let’s cover a few important details. Slovenia hiking trails are best tackled between June and September. In June, there will likely be snow on the trails, so extra gear might be necessary on high alpine routes. When we hiked in July, we hiked through 4 small snowfields, which were easy to navigate with hiking poles. If you’re hiking hut to hut, you’ll likely encounter assisted climbing routes (via ferrata). We highly recommend bringing a via ferrata kit (especially a helmet) for safety. All trails are easy to follow and marked with the Knafelc waymark, which is a red circle with a white center (like a target). Kamniškem sedlu is a picturesque mountain saddle in the Kamnik-Savinja Alps. Just below the saddle, there’s a koča (mountain hut) that serves food and refreshments. 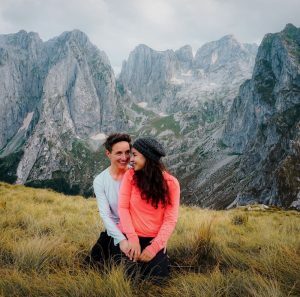 We loved this hike in Slovenia because the mountain views from the saddle are spectacular. With panoramic views of the Southern Limestone Alps and the most perfectly situated mountain hut below, you’ll rejoice that you don’t have to share this special place with very many people. The hike to the Kamnik saddle begins at the mountain hut Dom v Kamniški Bistrici, a 20-minute drive from the town Kamnik, or a 1.5-hour drive from Ljubljana. Note: we used public transit to reach the trailhead. This hike takes 3.5 hours one-way. While the trail isn’t technically difficult, it is continuously uphill. The trail begins steeply and ascends through forest via a narrow path. Simply follow the trail markers, which are red circles with white centers (“target”). After 2 hours, you’ll pass the shelter Pastirji. Soon after, the trail enters a wide-open meadow and you’ll see Mount Brana and Mount Planjava. The trail ascends steadily to the saddle between Brana and Planjava. With every step, the views of the limestone mountains become increasingly more impressive. After a well-earned lunch and Radler at Kamniška koča na Kamniški sedlu (1864 m), you can extend your hike to the summit of Mount Brana. This difficult 45-minute climb to the summit is assisted with fixed cables and ropes and requires scrambling and use of both hands. Wear a helmet! To return to the trailhead, simply follow the trail you came up. 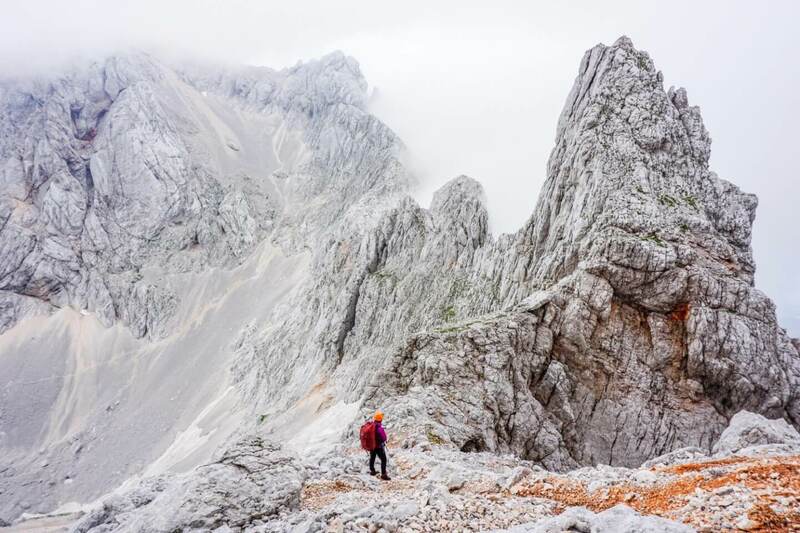 If you want to extend the hike, you can spend the night at Kamnik Saddle and hike the next day to Turska Gora (2251 m) and Cojzova koča na Kokrskem sedlu (1793 m). This is a very challenging hike. To learn more about this route, read Stage 2 of our Kamnik-Savinja Alps Hike. Češka koča na Spodnjih Ravneh (“The Czech Hut”) is a charming mountain hut located in the Kamnik-Savinja Alps. Built in 1900, this rustic wooden hut is perched high above the Ravenska kočna valley and surrounded by limestone mountains. Češka koča (1543 m) is a doable day hike if you’re starting the hike from the valley of Jezersko, which is a 40-minute drive from Kranj. If you’re looking for a place to stay in Zgornje Jezersko, we suggest Glamping & Hostel Stara Pošta. We highly recommend hiking up here in the morning and eating lunch at the hut. Though their menu is limited to only a few items, their food is hearty and delicious. There are two different trails to the mountain hut, so you can hike this as a loop. From Jezersko Valley, you can start the trail at Planšarsko jezero lake. Follow the road into the glacial valley Ravenska kočna, and follow the signs to Češka koča. This is the more beautiful trail. Alternatively, you can hike from the town center of Zgornje Jezersko to the hut via a forest trail. From the town center, cross the Jezernica river and follow the road and look for a trail leading to the left towards Makekov Marof. Allow 2 – 3 hours uphill and an additional 2 hours return. Want to learn more about this hike? Read our Kamnik-Savinja Alps Hiking Route. This guide covers each day of the trek in depth. It also tells you how to prepare (e.g. 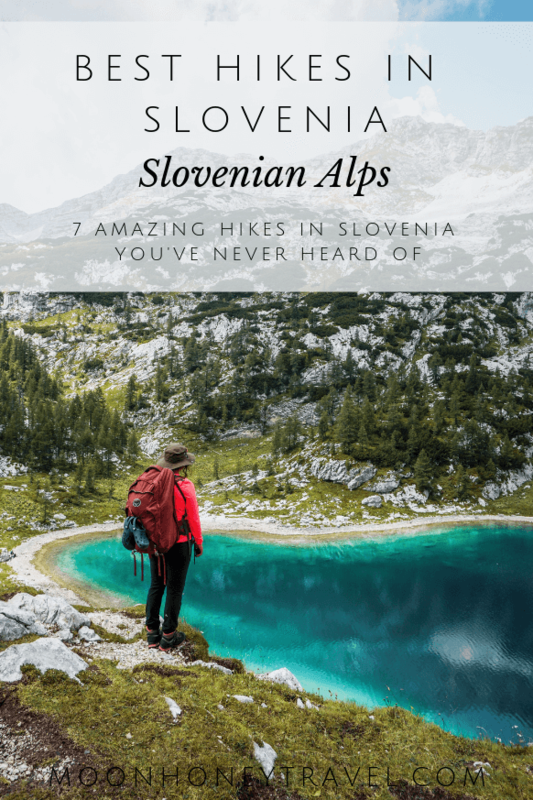 making reservations for mountains huts), how to save money on accommodation and what essential items to pack to make your hut to hut hiking trip in Slovenia a success. Hiking to Martuljek waterfalls (Slap Martuljek in Slovenian) is a wonderful half-day excursion, suitable for the whole family. If you have a copy of the Cicerone Walking Guide: Julian Alps of Slovenia, this hike is listed as Walk 4. To reach the waterfall trailhead, you can take a 10-minute bus ride from Kranjska Gora to the small town Gozd Martuljek. Check bus schedule here. Alternatively, you can walk an hour to Gozd Martuljek. The walk follows path #5 along the Sava Dolinka River. As you approach Gozd Martuljek, look for a dirt road leading to the right. You’ll walk across open meadows for about 5 minutes before walking under an old stone railway bridge. From the meadow, you’ll have splendid views of the Julian Alps. Next, you’ll pass a charcoal burning site with information boards about the history of the industry. Right after the site, the trail splits. Take the left trail. The trail passes by a man-made waterfall and then enters an enchanting gorge with steep walls. 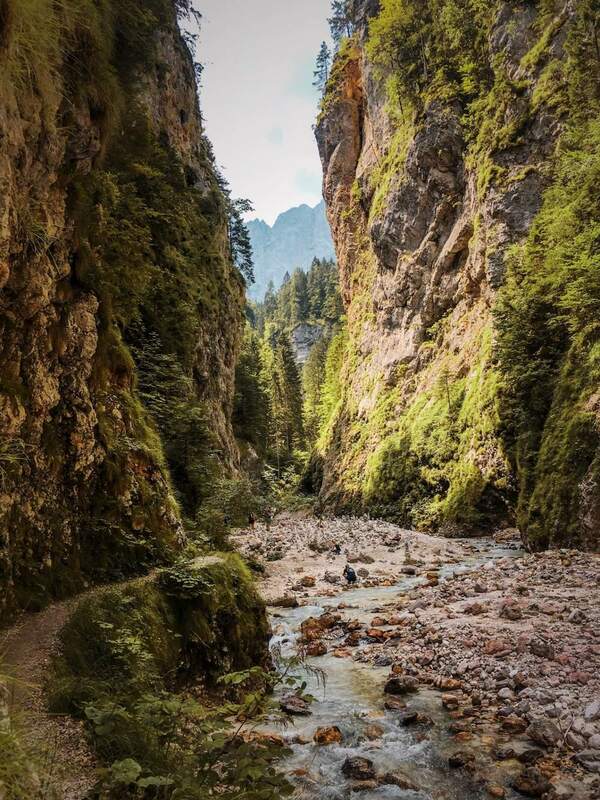 You’ll hike through the Martuljek Gorge. and then ascend to a nice viewing area of the lower Martuljek falls (spodnji slap). Continue on the path until you reach a junction with a wide gravel road. Turn left and head in the direction of Brunarica pri Ingotu (there are signs). Brunarica pri Ingotu is a mountain hut that’s situated on a meadow and surrounded by dairy cows. It’s one of those places out of a storybook. Stop here for a homemade stew, a drink, or simply the mountain view. Next, you can either continue the journey for another hour to the upper Martuljek waterfall (zgornji), or return back to Gozd Martuljek. We didn’t hike up to the upper falls, however we read that the hike requires a bit of scrambling. 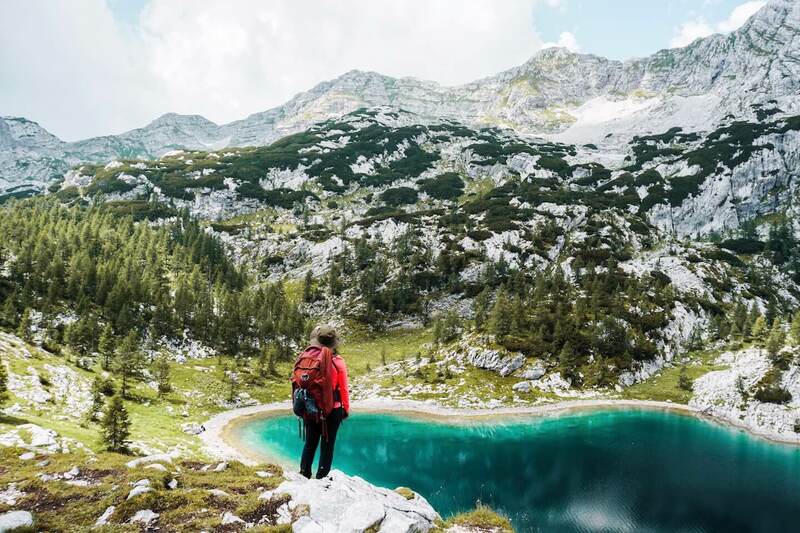 Triglav Lakes Valley is one of the most enchanting destinations in the Julian Alps and one of the best day hikes in Slovenia. The valley contains a string of seven lakes, each uniquely beautiful. The Triglav Lakes Valley trail begins at the mountain hut Koča pri Savici, close to Lake Bohinj. From the hut, you can visit the popular Slap Savica waterfall (3 EUR fee) before making your way to the Triglav Lakes Hut (Koča pri Triglavskih jezerih), 1685 m. It takes 3 hours and 15 minutes to reach the hut. You can have lunch here and make this your final destination. Alternatively, you can continue your journey for another 1-1.5 hours up the valley to lake Veliko jezero (Jezero Ledvicah), 1831 m. This deep-teal colored-lake makes for a good turning around point if you’re hiking here in one-day. 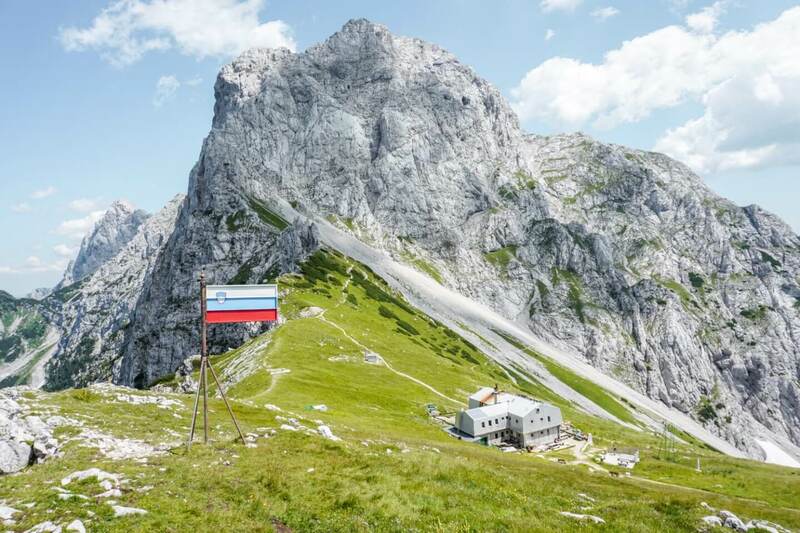 If you have 2 days, you can either overnight in the Triglav Lakes Hut, or hike all the way to the mountain hut Zasavska koča na Prehodavcih and spend the night there. If you have a copy of the Cicerone Walking Guide: Julian Alps of Slovenia, this hike is listed as Walk 30. Koča na Planini pri Jezeru is a mountain hut situated above an alpine lake and surrounded by rustic wooden huts and spruce trees. It’s a fairy-tale-like scene that makes you want to linger, milk a cow, and travel back in time. The hut serves traditional Slovenian soups and stews. 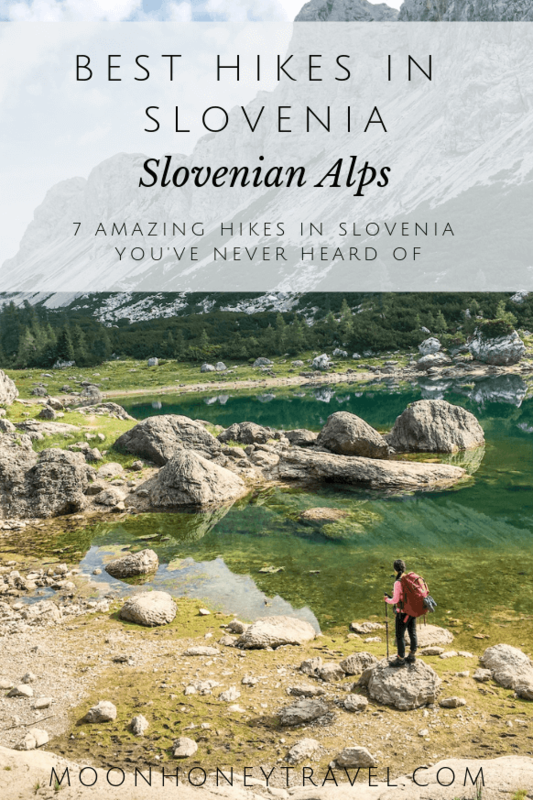 This is one of the best hikes in Slovenia because it’s tucked away from mainstream sites in an almost hidden wonderland of forest, rustic huts, and serene lakes. To reach Koča na Planini pri Jezeru, you can start the hike in Stara Fužina, or Planina Blato (shorter option). There’s a road that leads from Stara Fužina to Planina Blato, so if you have a car, this will trim a huge chunk of the hike. If you start in Stara Fužina, you’ll hike through Planina Spodnji Vogar, which is a high alpine pasture. The hike should take 3-3.5 hours one-way. There’s a mountain hut at Vogar pasture called Kosijev dom na Vogarj. Stop here for a break. From the hut, make sure to detour a few minutes to a lookout point of Lake Bohinj. From Vogar, the trail continues for another 10 minutes and intersects with an asphalt road. Hike up this road for 10 minutes and look for a trail leading off to the left. Follow signs to Koča na Planini pri Jezeru. After a bite to eat at the beautiful Koča na Planini pri Jezeru, you can take an alternative route back to Vogar via Planine Vodični vrh. Planine Vodični vrh is another high alpine pasture with a collection of rustic huts. Though we wanted to take this route to Vogar, we couldn’t because the trail was closed. Hopefully, it’ll be open in the future. 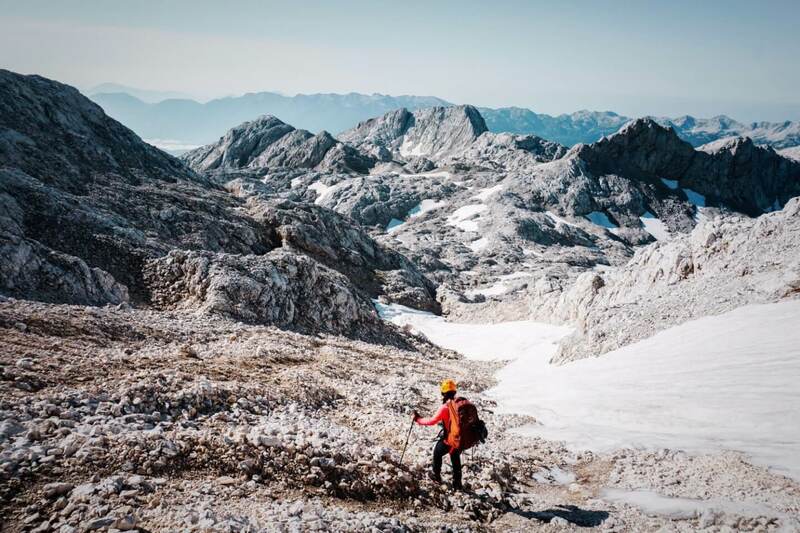 So if you’re looking for an epic Julian Alps hiking trail, we’ve got you covered. 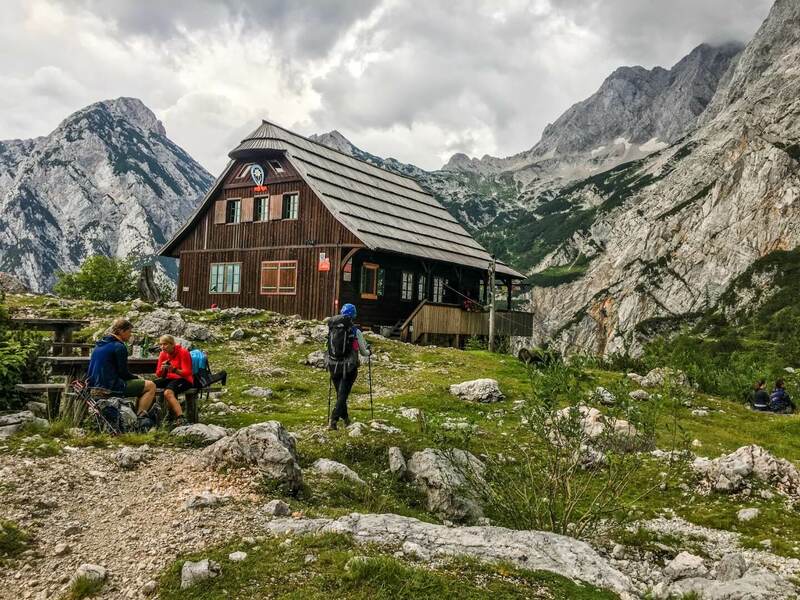 We hiked across Triglav National Park in 5 days and created this custom hut to hut itinerary. The hike starts at Vršič Pass (close to Kranjska Gora) and ends in Lake Bohinj. Hiking hut to hut in the Julian Alps was an unforgettable experience. Major highlights included seeing Ibex, the Edelweiss-filled high alpine plateau of Kriških podih, Mount Triglav, the Seven Lakes Valley, Luknja pass and the fairy tale pasture around Planini pri Jezeru. If you’re trying to decide which best hike in Slovenia to tackle, choose this one. 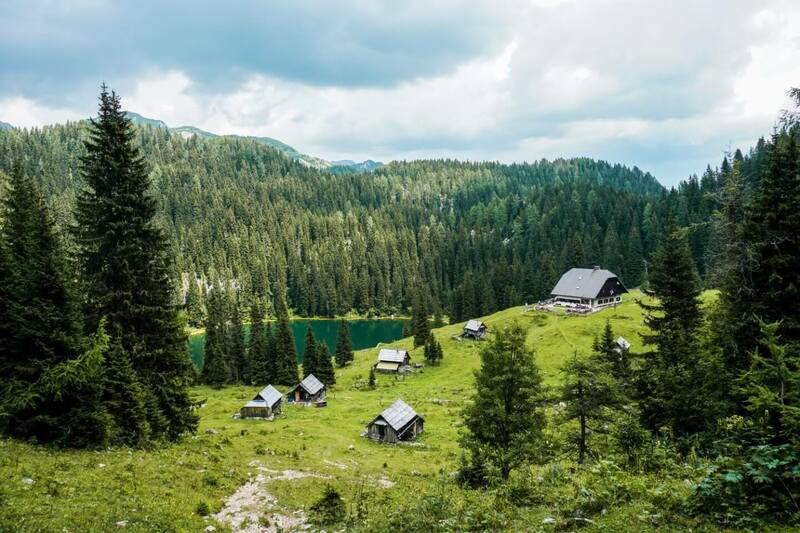 hribi.net – a resource for all mountain huts, peaks, connections in Slovenia. The site needs a redesign, but it’s a reliable source of information for all things hiking and mountaineering in the Slovenian Alps. You can find specific destinations and trails in the Julian Alps here. Info on Trail Closures – map indicating what trails are closed is maintained by the Alpine Association of Slovenia. There are some affiliate links in this post. If you make a booking or a purchase using the links, we’ll get a small commission at no extra cost to you. It’s how we cover the costs of running the blog! Woah all of these look amazing, but that waterfall hike really caught my eye! Hey Sarah! Thanks for the comment! 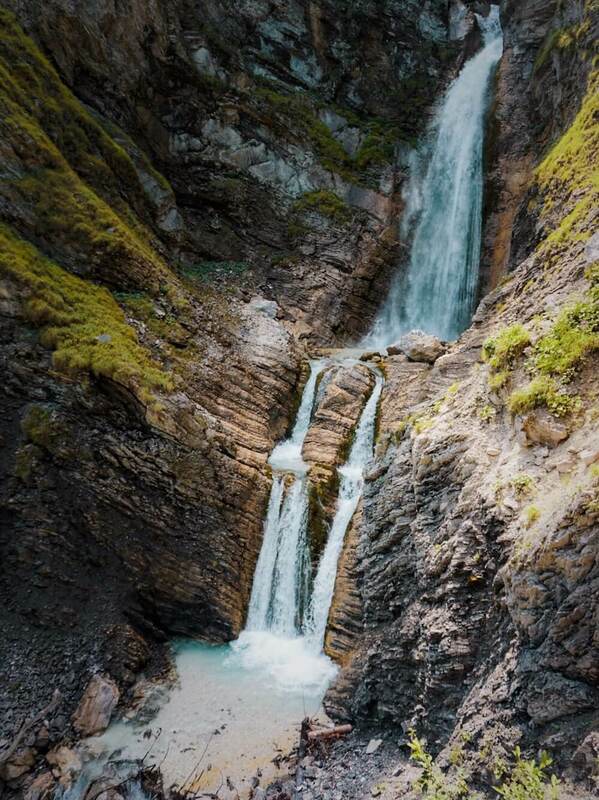 Yes, that waterfall is a lovely excursion, especially if you're near Kranjska Gora. Oh my goodness, you have me completely convinced! I would LOVE to go hiking in Slovenia. Did you have to pinch yourself to realise you were awake and really in such a beautiful place!? I mean, that Seven Lakes Valley is truly gorgeous and I love the views of the Martuljek Waterfall. What an amazing place for a holiday. Hi Josy, Thank you for the comment! Yes, we did - especially when we saw edelweiss flowers carpeting a high alpine plateau in the Julian Alps. Beautiful blog and post- I have pinned for future reference as I would love to go to Slovenia. And you are right- never realised there were so many amazing hikes to check out. Thank you Emma for the lovely comment! Yes, Slovenia has so many wonderful landscapes to explore. We can't wait to go back. I didn't realize Slovenia would be such a great place for hiking! All of those views are incredible! Thank you for the comment and visiting our blog! 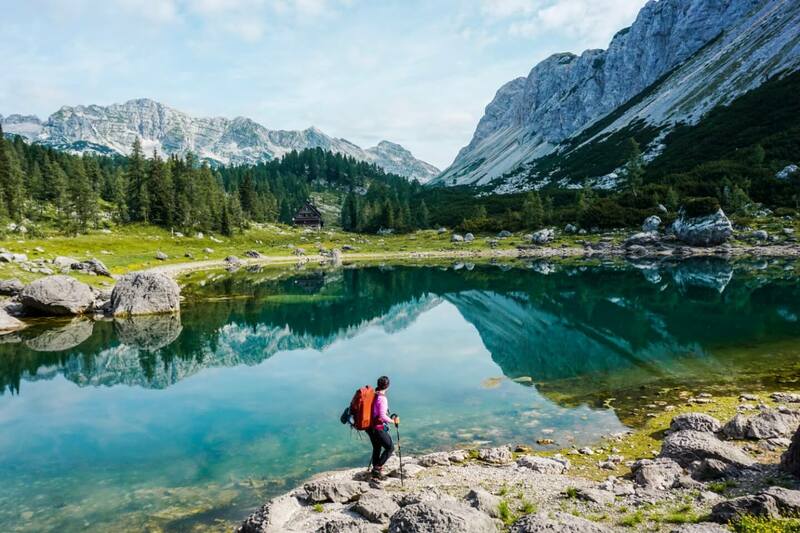 Slovenia is a hiker's paradise. Thank you for this list. I've saved Slovenia on my hiking bucket list and was wondering if you post GPS coordinates for the trails or at least the trailheads? I use the alltrails app but these day hikes simply aren't populating. Wondering if I'm searching incorrectly. Thanks in advance! We don't post GPS coordinates (probably something we should start doing). What do you need help finding? I'll send you the locations on google maps.